Last May I posted an initial review of Green Tea Restaurant in Woolwich Township, New Jersey. My first impressions were a little lukewarm – I wasn’t thrilled with some of the deep fried options nor the chirashi, but thought some of the specialty rolls were good or showed promise. Green Tea Restaurant, located in the Woolwich Center at 120 Center Square Road, is a relatively new pan-Asian restaurant. 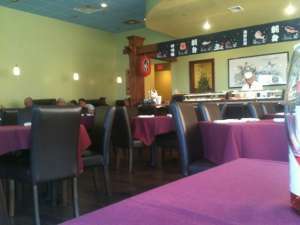 Like many Asian restaurants in Southern New Jersey, Green Tea serves a combination menu of Chinese, Japanese and Thai dishes and features a sushi bar. I’m always cautious with these mixed Asian restaurants which seem so prevalent in suburban and more rural areas, but it seems difficult for Japanese restaurants to survive in these areas without offering more familiar cooked dishes as well. 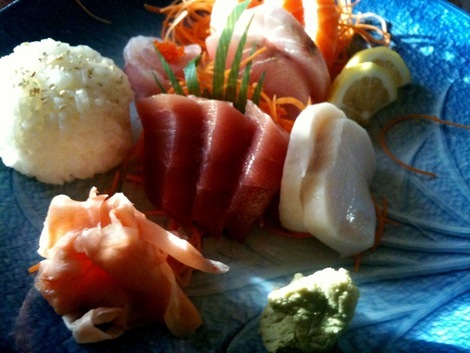 How fresh is the sushi going to be, and will the food be too bland and Americanized? Based on one visit to Green Tea, I can say they do a reasonable job with their Japanese food, with a few misfires that show a heavy hand when a lighter touch would be more appropriate. The dining room at Green Tea is open and bright, all pastel colors with minimal decorations. Booths line the wall and larger tables fill the middle of the room, which features a sushi bar in the back. Our hostess was very friendly and cheerful, quick to offer to open our bottle of wine (Green Tea is BYOB, however there is a liquor store in the shopping center if you show up unprepared.) The menu is quite large, divided into Chinese, Thai and Japanese sections. Of course, all of the standard dishes you’d expect to find for each are available; no real surprises but with Chef’s specials in each. Among the Chinese Chef’s specialties are Soft Shell Crab in Spicy Curry ($15.95) and Sunrise Crispy Prawns ($14.95). All cooked entrees are priced under $17, including seasonal specials such as Lamb with Thai Basil ($12.95) and “Rainbow Seafood” ($15.95). Mandarin Oriental is one of Mullica Hill, New Jersey’s few restaurant offerings. It’s located in the Shop Rite shopping plaza on Route 77 making it a convenient stop before or after food shopping. They offer a wide array of Chinese, Japanese and Thai dishes, typical of many Asian restaurants in the Jersey ‘burbs.